This high-level program has been designed by Shaolin Kung-Fu Master Rupert Harvey speciﬁcally for women. T he primary aim of Walk with Courage is to provide women of any age and at any fitness level with life tools and skills that will greatly increase their conﬁdence and reconnect them with the warrior spirit that resides in everyone. Participants will receive a Handbook and a Walk with Courage Level 1 Completion Certificate. Visit Golden Harmony Kungfu for more information and to register. 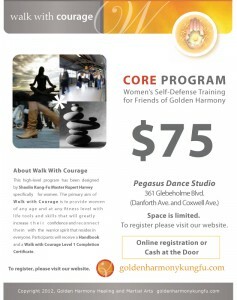 Upcoming: Walk With Courage Level Two, and more dates for WWC Level One. Please email me from my contact page for details.